Golden color always looks very radiant, young and classy. 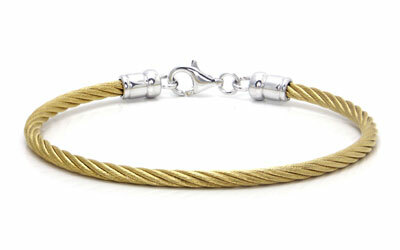 If you like such color, then this stainless steel bracelet would be a great choice. The type of the materials; stainless steel and sterling silver are pretty lightweight so it is very comfortable and easy to wear. Therefore you can always put the bracelet on all day and night. With this luxurious vibrant color on you, all attentions are on you.